Vettel is surrounded by Ferrari drivers after qualifying in CanadaCredit: Pirelli & C. S.p.A.
For a moment, it seemed as though this weekend may not be one for Sebastian Vettel. Red Bull confirmed they weren't confident about the track, felt it didn't suit their car, and Ferrari showed great pace in the practice sessions. What would qualifying bring? Well, yes, Vettel did get pole position, but Ferrari were up there too. Threats of rain were not fulfilled in qualifying, and McLaren may have compromised their setup hoping for a damper track tomorrow. For a quick reminder, or a catchup if you missed any of the action, here's a minute by minute replay via the Factbyte Factbox. Hello there, welcome to the Factbyte Factbox for qualifying for the Canadian Grand Prix. The weather in Montreal looks somewhat cloudy ahead of this session, but that hasn't stopped the crowds piling into the grandstands. In the three Free Practice sessions, we've seen many, many crashes already - most notably Vettel into that wonderful Wall of Champions. Today's big crash came at the hands of Pedro de la Rosa, who bashed his Sauber into the wall at the end of FP3. "De la Rosa?" I hear you cry. Indeed. The Spaniard is stepping into Sergio Pérez's car this weekend, after the Mexican did not feel recovered enough from his Monaco accident. There's an F1Minute on that, too. https://sidepodcast.com/news/sergio-prez-to-miss-canadian-grand-prix Just sayin'. Mark Webber had to sit out the entire hour of practice today with a KERS issue, whilst Vettel recovered from his crash yesterday to go fastest. Vettel on the challenge ahead: "I think it will be a tough weekend here. It's a long way as always. I think it's one of the most difficult Grands Prix to finish. The weather is not clear, we'll see. It will be a tough weekend." So far, people are voting high, and it's no wonder considering the number of incidents we've seen so far. Tweet from @clubforce: Both VJM04 chassis just being completed ahead of the qualy hour. At the moment the uncertain weather is the main question on our minds. Pedro de la Rosa on his late call to the Sauber team: "We could use my seat from last year which was important and vital, but all the rest was... I went out with my McLaren overalls, boots, helmet. We did a quick fix on the earpieces to match the radio from Sauber. The pedals were a compromise and that was that." Ten minutes to go until qualifying begins. Who is your money on for pole position? Vettel would be a safe bet, but he doesn't seem particularly confident this weekend. Fernando Alonso has been there or thereabouts in all practice sessions, but practice means very little. Martin Whitmarsh talks about the weather: "I don't mind if it rains actually, because we don't have the top end speed we need here. Sadly, it's probably going to remain dry here this afternoon. There's 60% probability for rain for the race. Do you set your car up expecting a wet race or preserving your tyre. We'll be setting up for a wet race. If it's more than 50% probability, if that's what they're telling you, you've got to react to that." Less than five minutes to go and live timing has reset. It looks like Sauber have managed to rebuild Pedro de la Rosa's car ahead of qualifying - what can he do on this one-off weekend? Jérôme D'Ambrosio heads out of the garage first, followed by Virgin Racing teammate Timo Glock. Vitaly Petrov is also out early. Felipe Massa sits in the garage, waiting for the optimum moment to head out on track. He's watching the monitors intently but looks calm and relaxed. Lewis Hamilton also sits in the car, his visor is half-down shielding his eyes from unnecessary distractions. Heidfeld, Karthikeyan and Liuzzi have all left the garage for an outlap. D'Ambrosio sets the first time - a 1:25.366, which is about ten seconds off the pace. Glock sets a 1:26. Last year's pole position was 1:15.105 by Lewis Hamilton - although it was on practically no fuel and he had to push his car back to the pitlane. Tweet from @OfficialLRGP: Place your bets! Nick Heidfeld has set a 1:17, but that is instantly dropped to second by his teammate Petrov, who just misses out on a 1:15. Jaime Alguersuari locks up massively heading into the chicane of turn 8. That's one set of tyres ruined. This weekend, the tyres in use are supersofts (red sidewalls) and softs (yellow sidewalls). Most are on the soft tyres at the moment. Every single car is out on track right now, which is an unusual occurrence. Likely because of the uncertainty over the weather. Fernando Alonso drops the times by putting in a 1:14.994. There may be concerns about the 107% rule for some of the slower drivers. Vettel posts a 1:14.703 easily taking the top spot. We've seen that so many times this year! Every driver has a time on the board now, Rosberg was the last to cross the line to set a benchmark. The drop zone currently contains Liuzzi, Sutil, Karthikeyan, Glock, D'Ambrosio, De la Rosa, Rosberg. Button complains on the team radio that he is struggling to slow the car down. He's tucked up behind a Virgin car as well, which may be frustrating him. Alguersuari cuts across the grass, and runs wide again, throwing up tufts of greenery here and there. He's struggling this afternoon. Vettel has dropped the top times to 1:14.011, and Alonso, Massa, Hamilton and Button behind him are all in the 1:14s. Pedro de la Rosa has bolted on the softer of the two compounds, red sidewalls, and it currently sitting in tenth place. Replays show he runs wide and makes contact with the wall. Alonso lowers the benchmark to a 1:13.822. That's dropped Karthikeyan out of the 107% time. He was in it, but has dropped back out again. D'Ambrosio also below the threshold. More than half the field have returned to the pits now, taking a moment before attempting another lap. Ted News: Alguersuari has far too much oversteer which is why he's struggling, currently last and over seven seconds off the P1 pace. The top eight drivers have remained in the pits, happy with their times for now. Just over four minutes remain. The drop zone now features Kovalainen, Alguersuari, Trulli, Liuzzi, Glock, Karthikeyan and D'Ambrosio. Replays show just how hard Pedro clouted the wall on his supersoft tyres. Sparks and everything! Alguersuari improves to 16th, dropping Kobayashi down to 18th and potentially out. Meanwhile, Paul di Resta pops up to 7th in the Force India. Karthikeyan has improved his own time to within the 107%, whilst D'Ambrosio still remains over half a tenth down on the HRT. Liuzzi has spun his car, he should be able to recover it and continue onwards, but he's in 21st, with no time to improve. Alguersuari pits from 17th place, and is almost instantly dropped out of qualifying by Kobayashi who improves to 14th. 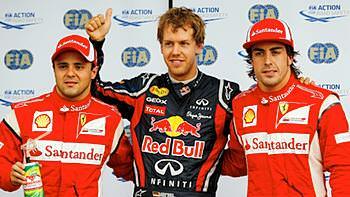 The fastest three in that session were Fernando Alonso, Sebastian Vettel and Felipe Massa. The 107% time was 1:18.989, and D'Ambrosio was a 1:19.414. Comment from RG: HRT mixing with the Virgins as well, well done to them. Tweet from @tonyfernandes: Great great job from both guys. Jarno and heikki did well. Best qualifying. Forced most of the middle teams to go option. Very happy. Tweet from @OfficialLRGP: We managed to pass Q1 without using the supersoft. Not all the middle teams then Tony. Pastor Maldonado is the first driver out on track, swiftly followed by a Renault, a Sauber and a Force India. A minute of the session gone and eight drivers out on track. Now just two Ferraris remain in the garage, the other fifteen drivers will be fighting for track space. Schumacher has put on supersofts already. It seems early to do that. Alonso has left the garage, leaving just Massa yet to head out on track. Petrov puts in the first benchmark, a 1:14.354, with next place Maldonado on a 1:17.871. That difference can only be tyres. Both Renault drivers are on supersofts, Heidfeld slips into second with a 1:14.719. Jenson Button jumps up to P1 with a 1:14.344, whilst Hamilton slips into 4th. Meanwhile, Vettel tops them all with a 1:13.690. Replays show Barrichello running his Williams really wide over the grass, bouncing back towards the track. Both Webber and Alonso have found their way into the 1:13s as well, the times are dropping massively now. Felipe Massa has just left the garage, with nine minutes to go. Those in the drop zone include Kobayashi, Sutil, Buemi, Maldonado, Massa, De La Rosa and Barrichello. Massa's first lap only improved his position by two places. Vettel jumps up to P1 again with a 1:13.486, meanwhile Barrichello is struggling with a 1:21.135 down in 17th. That's quite a difference. Massa puts in a more respectable time and slides into P6. Behind him Button, and then Schumacher, who is the first of the drivers not to be in the 1:13s. All drivers return to the pitlane bar Massa, Sutil, De la Rosa and Barrichello. Massa makes the most of the clear track to post P1 - 1:13.431. Those that need to improve are starting to return to the track, with five minutes of this session remaining. The drop zone currently features Kobayashi, Di Resta, Sutil, Buemi, Maldonado, De la Rosa and Barrichello. Rubens is on a hot lap right now, his car looks sturdy but not fast - he's certainly not attacking the final chicane as hard as others we've seen. He improves only to 16th, but is pushed back down to 17th again. At the moment, both Renault drivers are into the top ten, but only just. Petrov 8th, Heidfeld 10th, and they will have to run again to secure their positions. Paul di Resta is on a fast lap, it looks like he's going to improve into the top ten. The Force India driver loses a bit of time around the final sector and ends up 11th for now. Replays show he locked up, smoke pouring from the supersoft tyres. That won't have helped his laptime at all. Kobayashi crosses the grass again - that one section of lawn is getting a real battering today. Less than a minute to go, the top nine drivers are all in the pitlane, happy with their times. The bottom nine are desperate to improve. Of the top ten, only Heidfeld is out on track, worried about keeping his place in Q3. Heidfeld kept his place in the top ten, but will likely be a set of tyres down on the rest going into Q3. Interview with Timo Glock: "We gambled a bit because on Thursday and Friday it was clear it would be wet over the weekend. We had nothing to lose so we put the maximum downforce on the car. This morning the weather changed a bit, that cost us quite a lot of top speed. We struggled to get the best out of the car. I managed to get a good lap out of it, like I did in Monaco. It's a one lap wonder that you have to hit here, it was good." In a last ditch attempt to get through, Kamui keeps his foot in despite sailing close to the wall. He qualified 13th. Interview with Jarno Trulli: "Considering I'm still struggling with this car and especially the power sterring, which means I can't get the best out of the car and myself. I was a little bit concerned because yesterday I felt comfortable in the car, but this morning I was struggling with the brakes and we had to change them completely. I'm happy for the team anyway because we're getting closer." Interview with Paul di Resta: "Maybe the tyre choice, we opted to save a set of tyres for tomorrow. If I'd put the lap together as it should have been, there was just a small mistake, it maybe would have been close with Nick. There wasn't much left, we're probably in a better position starting on the better side of the grid, and we've got an extra set of tyres for tomorrow." Comment from Lukeh: Maldonado has outqualified rubens now for 3 races in a row. It's ok though because I'm expecting rubens' car to have the usual problem tomorrow, it's what his car does! The final ten minute shootout to decide pole position begins, with four cars piling out on track immediately. Webber, Hamilton, Button and Heidfeld are all out for an early run. The two Renault drivers join them. The Meteo-France weather updates given to the teams confirm there is no rain expected in the next thirty minutes. All cars now out on track except for Michael Schumacher. Felipe Massa puts in a P1, the times currently at 1:13.820. Webber and Vettel both on laps now. Vettel up to a 1:13.014 - can he get into the 1:12s? From @CWSGroup: These skies are the reason no one is waiting to set a lap time. Alonso jumps into P2, but Massa improves to knock his teammate down to third. Vettel still holds P1 and he returns to the pitlane. Just four minutes to go, and the McLarens are sitting 5th and 6th. They've got some work to do to overhaul the Red Bull and Ferrari drivers this weekend. Current order: Vettel, Massa, Alonso, Webber, Hamilton, Rosberg, Button, Petrov, Heidfeld. Comment from Amy: right, once Vettel wins this one he will have won the same number that Jenson won in 2009, so he can feel free to stop anytime. Michael Schumacher is out on a hot lap at the moment, he is 1.8 seconds off P1. Live timing seems to be struggling at the moment. F1.com is stuck at 5:48. Schumacher doesn't improve on his tenth place position, but is going again for another lap. Nico Rosberg has pitted from P6, he's given up with the session. Mark Webber's hot lap sees him fourth, which is no improvement for himself. Schumacher crosses the line 8th, Hamilton just behind him is 5th. Even Sebastian Vettel couldn't go faster than his own P1 time. Alonso is to second. Massa takes third, just missing the Wall of Champions by the tiniest of margins. Vettel takes his sixth pole position of seven races, but it's interesting to see Ferrari doing so well around this track. That great gap analysis, or gapper as I prefer to call it, suggests to me that Vettel is his usual self, Alonso and Massa may as well be the same person, Webber is struggling as usual, and Hamilton is a bit lost in the wilderness. You can't discount the fact that some teams, including McLaren, will have set up for a wet race tomorrow. Top three in Canada qualifying. Tweet from @alanbaldwinf1: Vettel takes pole and tells team: "Thanks for fixing the car on Friday after I stuffed it in the wall". Six out of seven. Christian Horner admits they didn't expect to get pole because it's one of their weaker circuits, they've gone for a compromise setup for both wet and dry conditions, and Mark Webber did not have KERS in that session. Interview with Mark Webber: "It was good actually. I was happy with how we recovered. Couldn't have got much more out of the car. Certainly a front row would have been nice to have. The guys did everything they could and in the end we didn't have any KERS. It's a mixed race, we know, interesting race tomorrow coming up. " Interview with Button: "It's always frustrating when you're not quick. We didn't have the pace that we thought we would. We always know our race pace is better than qualifying. My last run was looking really good, then I overdrove, started locking up and lost a bit of time. I was very close to pipping Nico at the end but it didn't happen. Starting seventh. A lot can happen here, this is a circuit you can overtake." Button says he isn't running with a wet setup, and that you don't do that in F1 at the moment - you have a compromise setup. Which is not quite what Whitmarsh told us earlier. Press Conference Quotes - Sebastian Vettel: "Pressure yes, we've seen all this weekend it's pretty close. Going into this weekend this is not our strongest circuit. We like high speed corners, there are not many of them here. I think we can be confident, the runs we had looked promising. The pace is there in the car, it's never easy and it won't be easy tomorrow. The last two races we are always ready to fight, we'll see what happens tomorrow." Another qualifying session complete, and Vettel had it all his own way again. Webber did an amazing job to get fourth with no KERS, and Ferrari showed improved pace. What does this all mean for tomorrow? There's confusion over who is set up for dry or wet racing, and we don't know for certain which way the weather will turn anyway. Despite a couple of close calls, we didn't see any drivers clout the barriers, which means 8% of poll voters were correct. 40% of the votes went for three or more, which is slightly optimistic with hindsight. It'll be a different story tomorrow though. You can't get through a race in Canada without a Safety Car, can you? Who do you think will win? Join me here tomorrow and we'll find out!